Looking for a way to personalize your holiday decorations? I really like handmade pieces — each one is a little different and they all have some significance. And a holiday-themed craft is a good way to keep kids busy and involved in the planning. 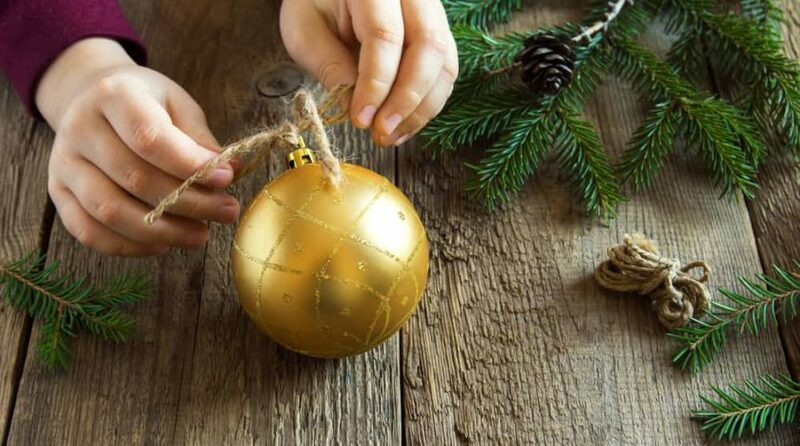 Here are some fun ways you and your kids can put a little DIY in your Christmas decorations this year. Baby sock ornament. I love the idea of turning one of your baby’s very first tiny socks into a keepsake ornament. Stitch a small loop of ribbon into the ankle of the sock and add a tag with the year and baby’s name and age, weight and length — or any other details you want to remember. Really simple and adorable. Baby sock Advent calendar. One sock is cute, but two dozen are even cuter! Count down to baby’s first Christmas with Martha Stewart’s baby sock Advent calendar (pictured at left), which is surprisingly easy to make, considering that it’s a Martha craft. You’ll need 24 socks, a length of ribbon and some tiny clothes pins. 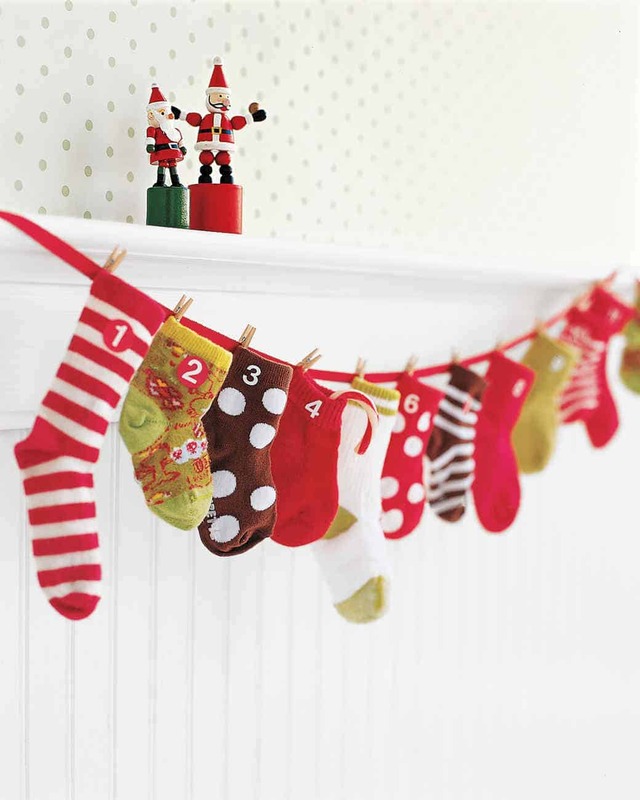 Fill the socks with small gifts or treats, clip them to the ribbon, and hang it on a mantel or stair rail. Super easy. Lost all the baby socks? (It happens.) Hannah Andersson has some really adorable options. Photo mosaic. I’m really fond of ornaments that incorporate our best memories from a particular year — which is why I really like the idea of a DIY ornament utilizing your Flickr images and Big Huge Labs’ mosaic maker. Simply choose your photos, create a mosaic with them and attach to card stock. This could also work as a Baby’s First Christmas ornament because if you’ve had a baby in the past year, let’s face it, most of your memories and all of your photos are of the baby. Plaster hand print. These are great for babies and toddlers — you can make hand print ornaments with bigger kids and footprints for tiny babies. You can purchase a kit which gives you everything you need, though it’s as easy to collect your materials at the craft store. Hand print ornaments make great gifts for grandparents, and the kits are a nice baby shower gift. Smaller ornaments can double as gift tags — and when your kids help make them, it’s that much more special when you share them with friends and family. Peppermint wreath. 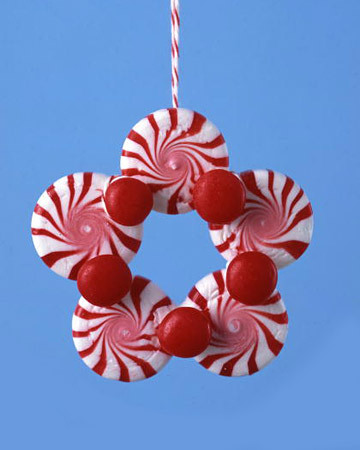 I have a feeling my kids would try to eat this Martha Stewart peppermint candy wreath ornament — the peppermints and cinnamon candies are all held together with icing, which is like an invitation to snack. But still it’s really cute and simple to make so that feels like a Christmas miracle right there. If you want to try something bigger, Martha’s candy cane wreaths are really pretty and also not all that complicated (although they do involve glue and sealant, so not so easily snacked on). Clay gingerbread men. Wee gingerbread men made of polymer clay are a nice way to decorate a package or a tree. This would be a fun and simple craft for kids to help with. Roll out the clay, cut the shapes with cookie cutters and bake. Be sure to make a hole in the top to thread a ribbon through. Tie the gingerbread man to your packages with a pretty bow and you’re all set. Modern paper ornaments. Remember making paper chains as a kid? I loved doing that. These cool ornaments are a more sophisticated twist on that idea: You cut card stock or heavy wrapping paper into strips of various lengths and staple the ends together to create a layered oval paper sculpture. Design*Sponge has an easy-to-follow tutorial that lays out the basics. Larger versions make wonderful window decorations, or you could size down to use as decorations on gifts or on the tree. 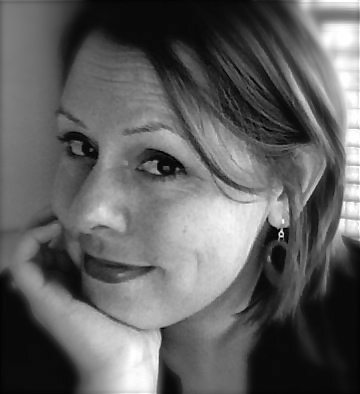 Melissa Summers was a regular contributor writing Melissa’s Buzz Off.